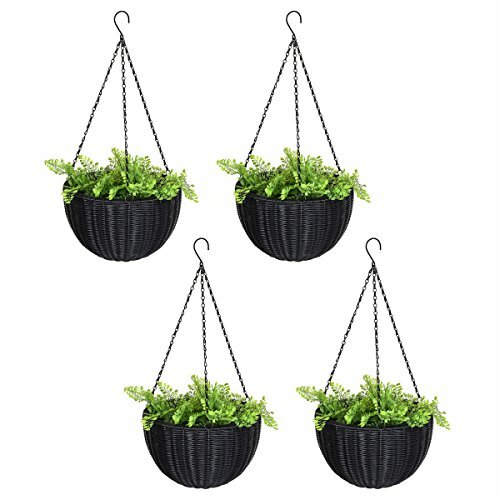 Edxtech Set Of 4 13.8'' Round PE Rattan Garden Plant Hanging Planters Decor Pots by Unknown at Tulips Orchids. Hurry! Limited time offer. Offer valid only while supplies last. our set of four 13.8'' round PE rattan hanging planter features a contemporary craft look for a delightful play of light and a natural splash of fun. our set of four 13.8" round PE rattan hanging planter features a contemporary craft look for a delightful play of light and a natural splash of fun. Includes a decorative, rust-resistant triple-chain hanger for easily hanging around. You'll love the eye-catching wicker-style design of these attractive planters, and you'll appreciate their exceptional resilience and durability. Attractive woven look and texture that's remarkably similar to real rattan and the rounded design makes them an attractive addition to any part of the home indoors or outdoors. Do not hesitate to buy them. weight of each one: 3lbs.